Inmerse yourself into the amazing world of the Green Iguanas, an specie in danger of extinction. 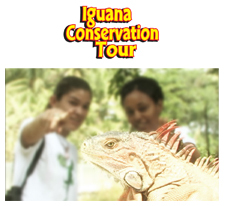 Discover at the Iguana Conservation Tour all the details involved in the raising, protection and care of this wonderfull reptile. At the tour you'll have the opportunity to interact with living iguanas and also enjoy the beauty of botanical gardens surrounding the attraction. The biological richness is increased by the Refuge's marine coastal areas which include coral reefs, sandy beaches, fossil lined coral caves, mangroves, varying marine floors from silt to sand to rock to coral. You'll also enjoy a giant-screen video documentary on our projection room explaining the life stages and many other interesting facts related the growing and living cycle of the iguanas. For adults it is a great opportunity to get closer to a very unique reptile only found at the most remote places on the planet. It's like experiencing a documentary in living flesh.